Entropy-maximization represents the unifying concept underlying the definition of a number of methods which are now part of the discipline known as "network theory". 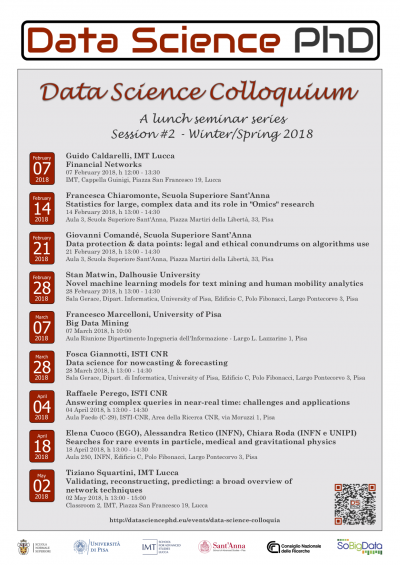 This talk is devoted to illustrate the methodological aspects of the aforementioned approach, with particular emphasis on the definition of null models. The latter can be employed in a number of applications, as pattern detection, network reconstruction and link prediction: examples will be provided of all of them, by taking as case studies two real-world systems, i.e. the World Trade Web and the Dutch Interbank Network. Lastly, the performances of different reconstruction algorithms in reproducing the structural details of the two aforementioned systems will be compared.